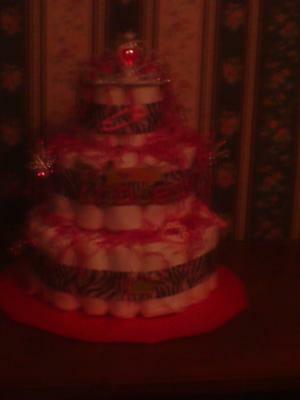 Adorable Princess diaper cake is 3 tier. It is adorn with 62 size 1 diapers. It has detail zebra ribbon along with "Lil Princess" added to the ribbon. On both sides of the cake are wands and on the wands are a pink pacifier and on the other one is a rattler. The top layer is where the beautiful Tiara with pink dots lay. The filling for the cake is fushia filler. Everyone has really liked this cake.